French philosopher of the Cartesian school, the youngest child of Nicolas Malebranche, secretary to Louis XIII, and Catherine de Lauzon, sister of a viceroy of Canada, was born at Paris on the 6th of August 1638. Deformed and constitutionally feeble, he received his elementary education from a tutor, and left home only when sufficiently advanced to enter upon a course of philosophy at the Collège de la Marche, and subsequently to study theology at the Sorbonne. He had resolved to take holy orders, but his studious disposition led him to decline a stall in Notre Dame, and in 1660 he joined the congregation of the Oratory. He was first advised by Père Lecointe to devote himself to ecclesiastical history, and laboriously studied Eusebius, Socrates, Sozomen and Theodoret, but "the facts refused to arrange themselves in his mind, and mutually effaced one another." Richard Simon undertook to teach him Hebrew and Biblical criticism with no better success. At last in 1664 he chanced to read René Descartes' Traité del l'Homme, which moved him so deeply that (it is said) he was repeatedly compelled by palpitations of the heart to lay aside his reading. Malebranche was from that hour consecrated to philosophy, and after ten years study of the works of Descartes he produced the famous De la recherche de la vérité, followed at intervals by other works, both speculative and controversial. 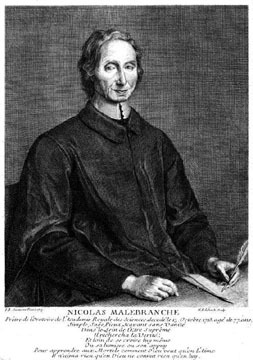 Like most of the great metaphysicians of the 17th century, Malebranche interested himself also in questions of mathematics and natural philosophy, and in 1699 was admitted an honorary member of the Academy of Sciences. During his later years his society was much courted, and he received many visits from foreigners of distinction. He died on the 13th of October 1715; his end was said to have been hastened by a metaphysical argument into which he had been drawn in the course of an interview with George Berkeley.